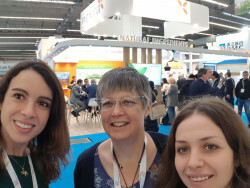 Last week Blanca Camarasa, Valeria Valkova and Carolyn Pritchard from our Commercial Department attended Health Ingredients Europe in Frankfurt, Germany. HiE is one of the leading nutritional ingredients exhibition, which highlights the next big trends in nutritional products and showcases the latest innovative solutions to market challenges. Every food company is striving for the best way to reduce sugar, salt and fat to achieve healthier products, but keep the flavour profile and texture of their products. This is a trend that we have been seeing for several years, but the perfect solution has still not been found. Companies still need to make a compromise and choose priority for their products…is it health, or is it taste? Walking the floor at HiE we saw many companies offering their solutions to these difficult conundrums. From the flavour perspective, you could see solutions offering enhanced natural flavours from buttery notes, umami or different natural sweeteners. From the texture and mouthfeel perspective, novel proteins are being offered, such as hemp, pumpkin or algae to replace not only the traditional dairy or meat protein sources but also the well-known pea or soya plant-based sources. These new proteins are arriving with highly interesting messages regarding health and functional benefits and claiming very high PDCAAS numbers. They all have the same goal of healthy, tasty food to help fight the Western World’s war against obesity, secondary diabetes and heart disease. It is clear that the access to new protein sources is possible and the production of new ingredients is already happening. Comments from suppliers is that even more could be achieved if food legislation could keep up with the speed at which new innovative ingredients are being discovered and consequently more novel products could be launched to market. The health benefits that are naturally derived from plants and animal products were also on show in the exhibition hall. Many companies were promoting products to support joint health and improve muscle mass, be it for the fitness markets that are looking for fast release proteins like whey hydrolysates or for the elderly market were sarcopenia and poor dietary profiles are of major concern. Collagen was also very visible on the stands, even if it does not fit within the vegan / non-animal product trend, it’s versatility is still increasing and new products for new applications keep arriving every year. HiE18 was a really interesting conference where lots of market experts shared their knowledge and discuss the dynamics of country legislation versus company and consumer interest.